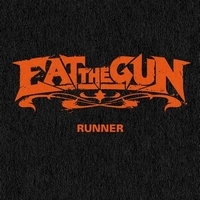 The German rockers Eat The Gun present their 4th release (3rd full-length album) which they called Runner. The trio opens up with the title track, a heavy, riff-based rocker with tempi changes, memorable guitar lines and catchy vocals. They hooked up with producer Toni Meloni (The Sorrow, Apokalyptische Reiter, Toten Hosen). Playing live a lot surely helped them to develop. At The Evil In You And Me the vocals remind me a bit of Megadeth... A bit like a rock version of the Americans - at least for a good part of the song -, but for the chorus they change to a more melodic style. Songs like Not Dead Yet show that one can write heavy rock and use more then two / three chords. The band knows how to stick to their sound and vary. They can write memorable tunes without lacking heaviness. Down In The Fire is spiced up with a dash of Southern rock, slowly they head into this emotional rocker. Another one of my favorites is I'm Obsessed which has an 80's vibe. Live fans will join in at My Retribution shouting the words and party. The closer Three Six Five is based on a massive bass riff and starts with spoken words, then they head into this riff-based rocker which combines heavy riffs with melodic vocals. Eat The Gun managed to present an album with varying heavy rockers, all on the same level which make it pure fun to listen. And it seems that the songs will sound even better live... We'll see.